DE WIT - Rhinolandiae, Amstelandiae et circumiacent. Aliquot territor . . .
DE WIT, F. - Rhinolandiae, Amstelandiae et circumiacent. Aliquot territor . . .
Rhinolandiae, Amstelandiae et circumiacent. Aliquot territor . . . - DE WIT, F.
Title : Rhinolandiae, Amstelandiae et circumiacent. Aliquot territor . . .. Size : 17.5 x 21.3 inches. / 44.5 x 54.0 cm. 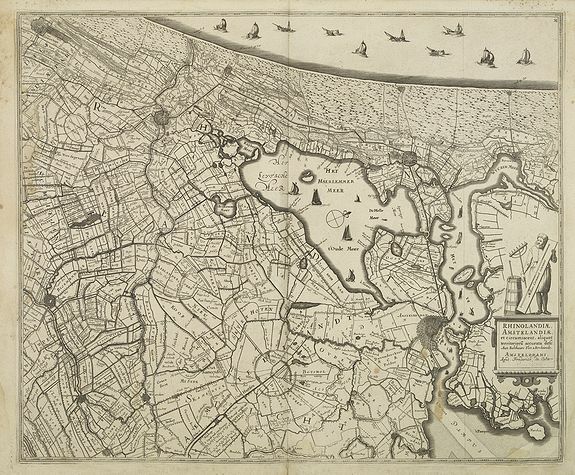 Description :Map centered on The Hague, Leiden, Haarlem, Amsterdam, Gouda, etc. West to the top. Prepared by Balthasar Floris van Berkenrode.BR>Originally the plate was published by Janssonius. This is the much rarer state by Frederik de Wit, who changed the address in the title cartouche. Embellished with numerous sailing vessels. Condition : A few brown spots lower right of engraved area. Some water stains all around margins. Else good and dark impression.